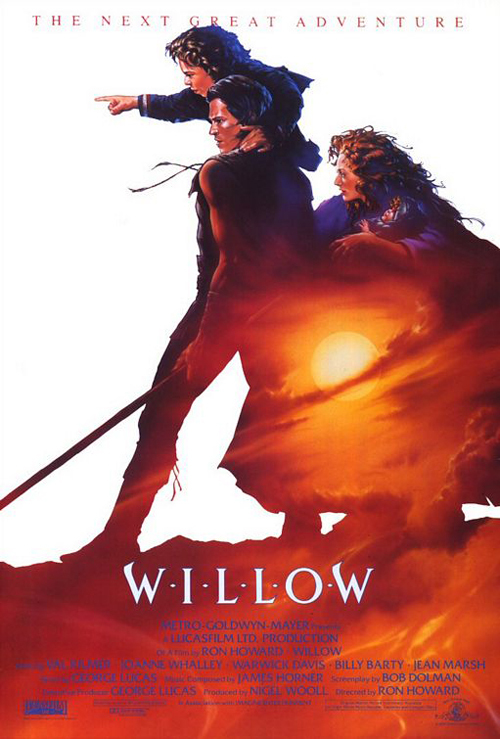 (SPOILERS) There’s a reason most ‘80s fantasy films, Willow included, were failures at the box office; they weren’t very good. 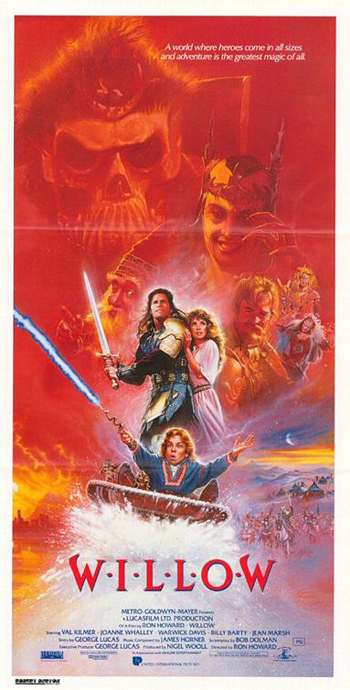 Sure, a nostalgic hue envelops many a Krull, or Labyrinth, or Dark Crystal, and they have their redeeming aspects, sporadically, but they fall far short of the storytelling drive, ambition or filmmaking flourish of the movie that inspired the trend they were a part of. That picture, Star Wars, was, of course, formulated by George Lucas over the course of a period when he had considered various options before pinning down the ideas for his family sci-fi/fantasy effort, among them reviving Flash Gordon; it is also said that he wanted to adapted The Hobbit and The Lord of the Rings, although the veracity of this is disputed (Wikipedia references his desire to make the horrifically-titled Munchkins, and there’s a 1987 interview in which he comments “I’ve had the idea for 15 years”; curiously there’s no mention of this knocking around his head in the exhaustive The Making of Star Wars). Whatever the precise details of its conception, 11 years after he changed the face of cinema, and by this point firmly entrenched in a producing capacity, he pretty much borrows Tolkien’s protagonists for an attempt to do for fantasy what Star Wars did for science fiction. But Lucas was a very different guy by that point; his passion and drive had gone, replaced with the status of a mogul, and consequently Willow is an entirely lacklustre romp, with all those Campbellian signatures and weaved disparate influences that worked so well in A New Hope coming to nothing. While Star Wars was fresh and invigorating, Willow is tired and limp, a flaccid imitation of Star Wars that almost studiously lacks everything that made that picture so defining. Indeed, one finds it difficult to conclude other than that Willow was hastily cobbled together, even if it wasn’t. It arrived five years after Return of the Jedi, at a time when Lucas was dabbling in TV (the Ewoks and Droids cartoon series) and lending his executive producer credentials to a number of projects that met with limited commercial reward (Labyrinth, Howard the Duck, Tucker: The Man and His Dream, The Land Before Time – the legacy of the latter running to 13 sequels, rather belying its modest box office performance). He hadn’t come up with anything fresh that actually worked since Indiana Jones, and might well have been feeling the need to assert himself, not in terms of finances, since things were more than rosy in that department, but creatively. It’s notable that, aside from the long-gestating Radioland Murders, he returned almost exclusively to Star Wars and Indy during the next 25 years; one might infer that the failure of Willow stung. Apparently George approached Warwick Davis during the making of Return of the Jedi about playing Willow (one of the aspects of the picture I can’t shake off, and it may point to an essential weakness in the title, or me, is that I never think of Davis character as being Willow; it should either be the baby, or Joanne Whalley, or Alyson Hannigan). There’s no prescriptive element to suggest you can’t have a successful movie with a little person as a lead (Lucasfilm is generally credited as being honourable and then some in that regard), but it’s probably wise to hedge your bets by casting someone who’s a really good actor if you do. Gilliam hit the jackpot seven years earlier with David Rappaport in Time Bandits, and Willow’s failure, while no means down to Davis’ adequate performance, would surely have been mitigated with a more seasoned performer (to be fair to him, he was carrying a lot of weight on his shoulders, only 17 years old during filming, and asked to play a father, complete with hero mullet). Besides Davis, Lucas picked Little Ronny Howard to be his wingman, or director at any rate, and it’s this crucial choice, more even that the waterlogged screenplay, that sinks the picture. He knew Howard from American Graffiti, of course, but was doubtless persuaded the budding director was the producer-stand-in for the job thanks to his flirtations with genre in Splash and Cocoon. Unfortunately, as proficiently made as those are (and fair-dos to Howard, he showed a lightness of touch for comedy that he’s now largely abandoned in favour of stodge), they suggested no particular aptitude for action, spectacle, an epic sensibility, and certainly not mythic trappings. Howard’s most comfortable ground, having been an actor, is working closely with actors. The further he veers from that into blockbuster territory (the execrable Robert Langdon films being the most obvious example), the more unflattering the results tend to be. Willow desperately needed someone who could imbue atmosphere and a sureness of tone, with a flair for world building, but it has none of those things. While there are some very pretty establishing shots (and grand locations), it carries the flatness of a TV movie, which can’t really be blamed on cinematographer Adrian Biddle, as many of Howard’s movies are like that. The score from James Horner, who also delivered the earlier Krull, sounds like a redux of his earlier work while anticipating the Oirish overload of Titanic. Most damagingly, he’s going for a swashbuckling “jaunty” effect, rather than exciting (possibly recognising there was precious little excitement to be milked). 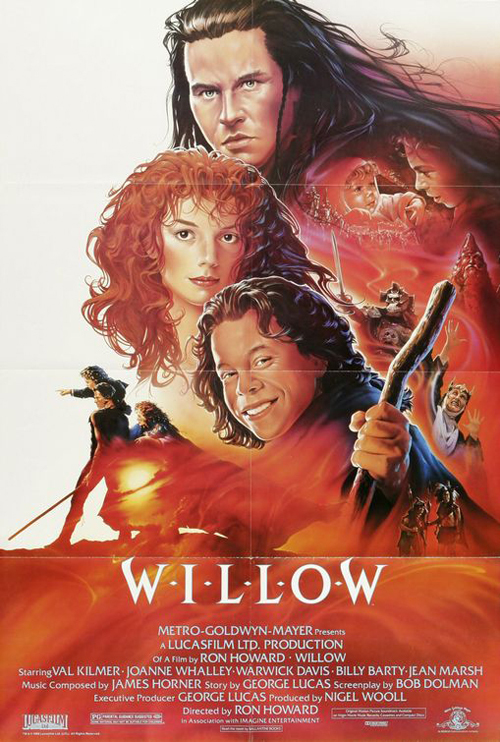 There had been fantasy movies during that decade that offered evocative, believably-inhabited worlds, most notably Excalibur and Legend, but Willow, despite not coming cheap, frequently looks it. It’s probably indicative that, rather than teasing out a screenplay with a writer of his choice, Lucas was steered to Bob Dolman, a TV guy who later worked with Howard on that Tom Cruise-starring stinker Far and Away. The plot’s a mess, despite going through seven drafts; the first half hour in particular is soporifically indulgent (to the extent of being near-patronising towards its village of little folk), pretty much until Val Kilmer shows up. It’s been much noted how Lucas borrows elements from The Bible (Herod massacring the innocents, baby Moses in the bulrushes), as well as Tolkien (the Newlyns) and Swift (the brownies, who tie down “giant” Willow at one point). It’s also been much noted how the characters are easily interchangeable with Star Wars types, from Kilmer’s loveable rogue Madmartigan (Han Solo), to Willow’s wannabe sorcerer (Luke’s wannabe Jedi), to Whalley’s warrior daughter of the evil queen who finds her moral bearings (Leia/Lando), to Jean Marsh’s evil Queen Bavmorda (the Emperor) and her high commander General Kael (Darth Vader by way of Skeletor), and Patricia Hayes’ sorceress Fin Raziel (Yoda/Ben). There are also the comedy sidekicks Rool (Kevin Pollak) and Franjean (Rock Overton), C-3P0 and R2-D2 equivalents, although they are really much closer to Jar Jar Binks on the sub-sub-Python irritation scale (showing that Lucas favoured applying stereotype-invoking accents to dubious races/aliens long before The Phantom Menace; here, they’re dumb Frenchies). After the consummately created environs of Star Wars, it’s most notable how little impact anything in Willow makes; the production design and costuming are forgettable, and the effects not special (the early morphing is much heralded, but it’s in the aid of some less than spectacular stop motion work, and the blue screen wouldn’t look out of place on an episode of that year’s Doctor Who). Whalley wanders around in an outsized helmet and looks every inch not the warrior (although she has never looked prettier, so there's that). General Kael (never a good sign when you’re taking overt swipes at your critics, in this case Pauline, and the dragon Sispert – Siskel and Ebert – find Lucas taking on petulance of almost Shyamalan proportions) almost seems to be a case of Lucas opting to see what it would have been like had he let David Prowse voice Darth Vader as well as prop up his suit. Nothing good is the obvious answer, as stuntman Pat Roach plays the heavy, and shows his own face; being that the character’s only aspect of note is his Masters of the Universe helmet, that goes down like ton of cold sick. Marsh is reliable in her stock villainy, but she’d done it before with Return to Oz and would do it again the following year in Doctor Who. Like the surrounding picture, Bavmorda casts no spell. We should be grateful for Kilmer, then, who almost single-handedly carries Willow with unwarranted zest and exuberance. He even gets to don drag. He can’t actually save the picture, but he tries his level best. Apparently, Excalibur (for its battle scenes) and an early version of The Adventures of Baron Munchausen (for its epic fantasy) were among the pictures Howard and Lucas looked at in preparation for filming; there’s no evidence whatsoever of either rubbing off. Howard (according to Stephen Dark’s review in the The Virgin Film Year Book Volume 8) was nicknamed “executive producer in charge of directorial affairs” on set, but there’s scant evidence of Lucas’ firm oversight, editorial or otherwise (Howard’s regulars are credited in the editing suite). But then, we could feel the slackening of George’s ambitions as far back as the third Star Wars. Kael, who sportingly referred to the General as an “homage a moi” called the plot “a whirring mess of porridge”, but that’s almost a compliment, suggesting there’s more going on here than there is. Willow’s a mess, but an inert one. There’s no whirring involved.